It's no secret that professional sport is a commercial enterprise. Sure, there's the love of the game, but no one would ever get to see that love in action without TV commercials and endorsements and sponsorships. In some cases, of course  the World Series, say, or the Olympics  one could argue that television networks and corporate sponsors are merely covering, inflating and capitalizing on an event that was going on regardless. That first year, the event was packaged as the "Extreme Games" and included skateboarding, bungee jumping, roller blading, mountain biking, sky surfing, and even street luging. As with the Olympics, winners were awarded gold, silver and bronze medals. Not everyone took the event very seriously. One especially snarky USA Today columnist called the X Games the "Look Ma, No Hands Olympics," adding, "Apparently  and it's possible I'm misinterpreting a cultural trend here  if you strap your best friend to the hood of a '72 Ford Falcon, drive it over a cliff, juggle three babies and a chain saw on the way down and land safely while performing a handstand, they'll tape it, show it and call it a new sport." 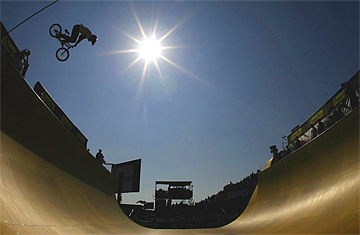 By 1997, the franchise had become successful enough that ESPN launched the Winter X Games, featuring skiers and snowboarders. The winter event eventually got substantially more "extreme" with the inclusion of sports like snowmobile freestyle and ice climbing  a strenuously athletic yet visually uninspiring sport that didn't prove popular enough to stay on the docket. But in one respect, USA Today wasn't far off: the X Games, both winter and summer, have become a proving ground of sorts, with organizers unafraid to experiment with burgeoning sports, some of which have stuck around and some which have fallen by the wayside after just a single season. While the X Games have helped legitimize now mainstream sports like skateboarding and snowboarding, the annual competition also feeds an audience hunger for life-threatening daredevilry. There are no lions, but at times, it's been easy to see the parallels between those who watch "Big Air" skateboarding and motocross and the bloodthirsty crowds at the Coliseum of Ancient Rome. At the 2003 summer games, one motocross rider left the competition in a wheelchair after crashing; another rider attempting a trick called the "Sterilizer" had an accident that sent him into convulsions in front of the crowd. In 2007, a skateboarder attempting a massive jump fell five stories to a wooden ramp and ended up in the hospital with a bleeding liver, bruised lung and bad case of whiplash. See sports pictures by Walter Iooss.